AUDJPY has be in a very clear ranging structure on the daily chart, and the last few days the AUD has been very strong. 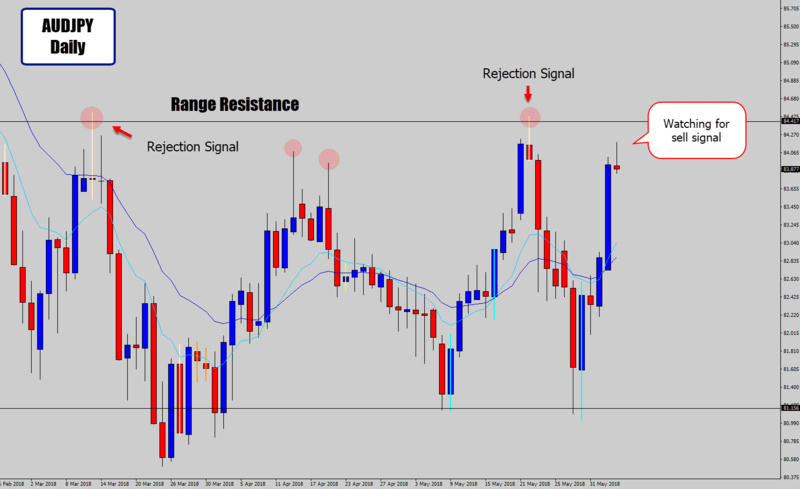 We can see AUDJPY rallied off the range support out of a bullish rejection candle. The recent strength has pushed price to back up to retest the range top. With such an extended surge upwards, a correction, or even reversal is likely here too. Combo that with the range resistance, and we have a compelling reason to be looking for sell signals. My antennae perked up when I seen that this session is already started to rejected higher prices, after an Asia session breakout past the previous daily high. These Asia session fake outs tend to produce strong moves in my experience. We could see the market drop from this area of resistance, so be on the look out for any selling opportunities. Waiting for a close of today’s candle or...?